Cookery Addiction | Addicted to cooking, eating out and food! 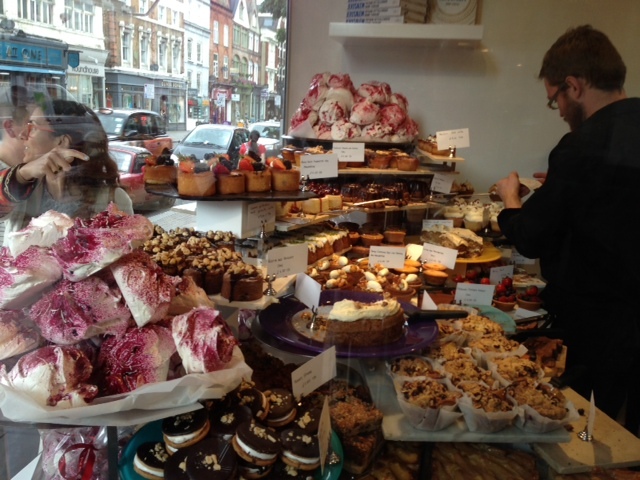 Last Saturday, after work, I met my good friend Michael for lunch at Ottolenghi in Islington. This restaurant is owned by the same chef who owns the restaurant Nopi, that I featured recently, here on the blog. There was a long queue for lunch, as they don’t take daytime bookings, we were told it would be a 30-40 minute wait. The time passed quickly enough as we chatted, looked at the menu and salivated over the food being sold at the deli section at the front of the restaurant. We were eventually seated and got lucky with a table for two. There is a large bench style table that runs the length of the rear half of the restaurant, communal dining style, but we were offered a table to ourselves. Prosecco was ordered as we looked again at the menu, and agonised over what to have! We decided on a main course, with three salads. 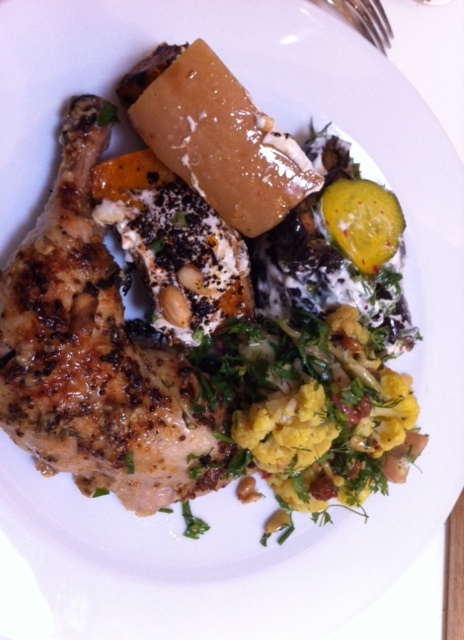 I chose free range chicken with orange, grain mustard, garlic, honey and sage as the main, and my three salads were; roasted aubergine with feta yoghurt, pickled cucumber, pink peppercorn and herbs, saffron cauliflower with caramelised red onions, sultanas, pine nuts, pomegranate seeds and celery, and roasted butternut squash with lemongrass sour cream, peanuts, Urfa chilli, lemon zest and mint. I have never been a huge fan of cauliflower, but Michael assured me it was delicious, done Ottolenghi style, and he wasn’t wrong. It was all absolutely divine. The only tiny criticism I have is that the chicken was very cold, obviously refrigerated after cooking, and it made it a bit difficult to cut up, but I can’t fault the taste. Dessert was a delicious passion fruit meringue tart, more Prosecco then an espresso. 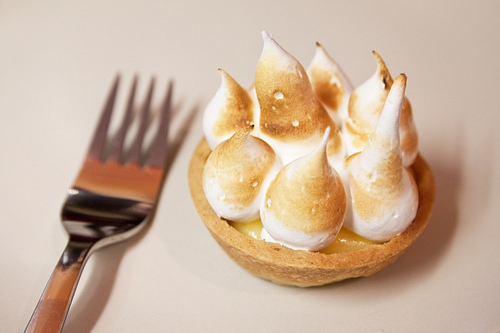 The tart was gorgeous, just the right amount of passion fruit cream inside and meringue on top. The service was excellent, the waitress was happy to recommend wines to us that would go well with our choices, she knew the products inside out. Lunch for two, with bread, wine, water, dessert and coffee was £90, and I was extremely lucky to be treated to this wonderful food by my lovely friend. My turn next time! If you find yourself in Islington and want a wonderful treat, or even a take-away (it’s all sold from the deli), I heartily recommend Ottolenghi. It basically involves you sending a food parcel to someone in the UK or Europe – you are matched on the 5th of the month, you email them asking their likes and dislikes, and of course to get their address, and then you send you parcel – maximum cost £10, by the 20th of the month. You then blog about what you received! Here is the link if you want to have a look and maybe sign up yourself. Let me know if you sign up, and I’ll make sure to check out your blog at the end of next month! 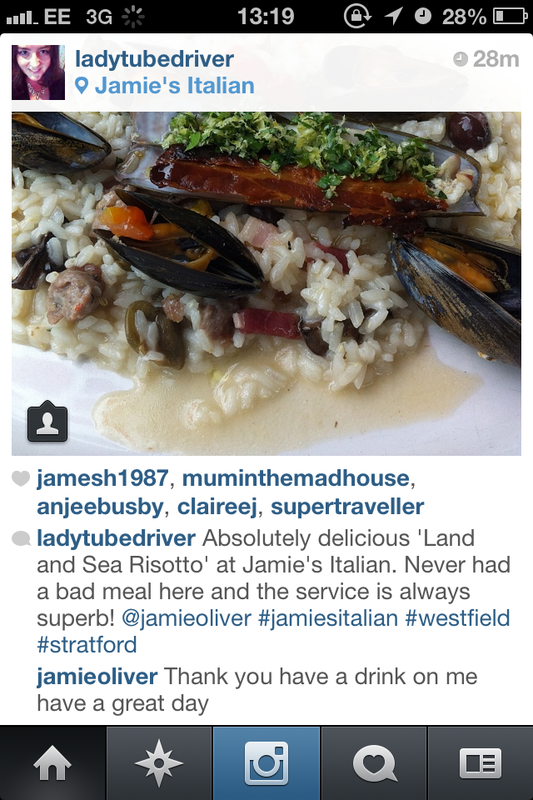 I’ve made no secret of it on this blog, we are big fans of Jamie’s Italian in this house. It may not be Italian haute cuisine, but I’ve never had a bad meal there, the food is always tasty and the service impeccable. And they are VERY nice to their younger diners. So when I suggested a lunch date there to the husband last payday, he jumped at it! We went to our local at Westfield Stratford City. 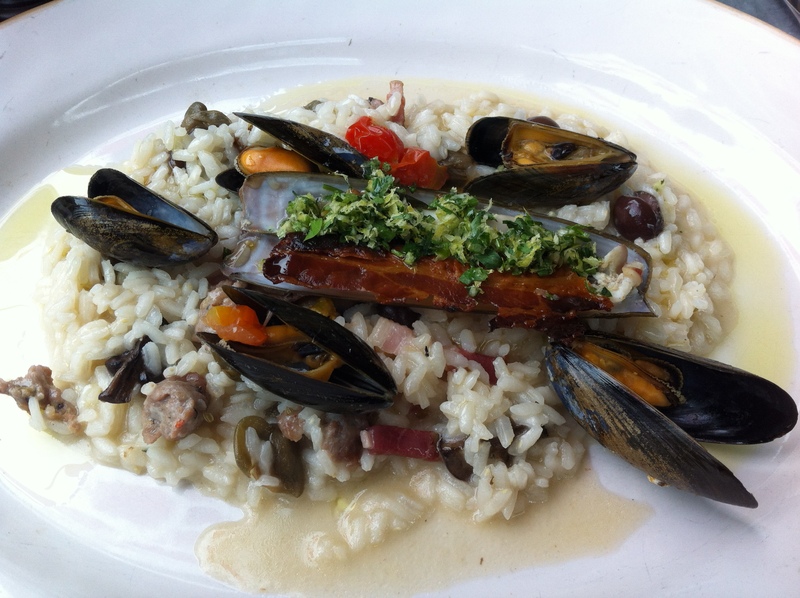 I was pleased to see some new dishes on the menu, and after much agonising, I chose the ‘Land and Sea Risotto’, described as, ‘Risotto with spicy Italian sausage, pancetta, mussels, clams, white wine, black olives, sweet baby tomatoes & field mushrooms.’ It arrived, and was quite simply delicious. Now being a fan of social media, and particularly Instagram (my username is @ladytubedriver) and Twitter (@cookeryaddict and @ladytubedriver) I took a photo of my lovely lunch and posted it on Instagram, tagging Jamie Oliver in the process. He is a big Instagram user, and I really hoped he would see it. I was absolutely chuffed to receive an almost instant reply, and the lovely glass of free Prosecco went down a treat. Thank you very much Jamie and staff, keep up the good work. As a London Underground train driver by day, I absolutely LOVE this idea, and will hopefully be checking it out later on in the Summer. Thanks to Emily at Chilli Marmalade for this tip off! I hate watching people eat on the Tube. I am always seeing people peeling fruit, nibbling chips, gobbling sandwiches and even scooping up salad with their fingers and it makes me cringe. The germs down underground are out of control. In fact, when I first arrived in London, I’d blow my nose at the end of each day and it was BLACK. That doesn’t happen anymore, I suppose my body has just embraced the dusty, sooty atmosphere and is now used to it. Blergh. Today, I saw that the Basement Galley is offering the chance to have an entire meal on the London Underground, and from the pictures I’ve seen, it looks like it’d be an amazing experience. 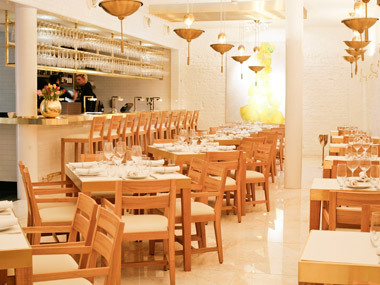 Last weekend, I went with five of my friends for brunch at Yotam Ottolenghi’s restaurant, “Nopi” in Soho. I had been assured that the food was superb, and having perused the menu for a good week prior to my visit, I was very much looking forward to it. 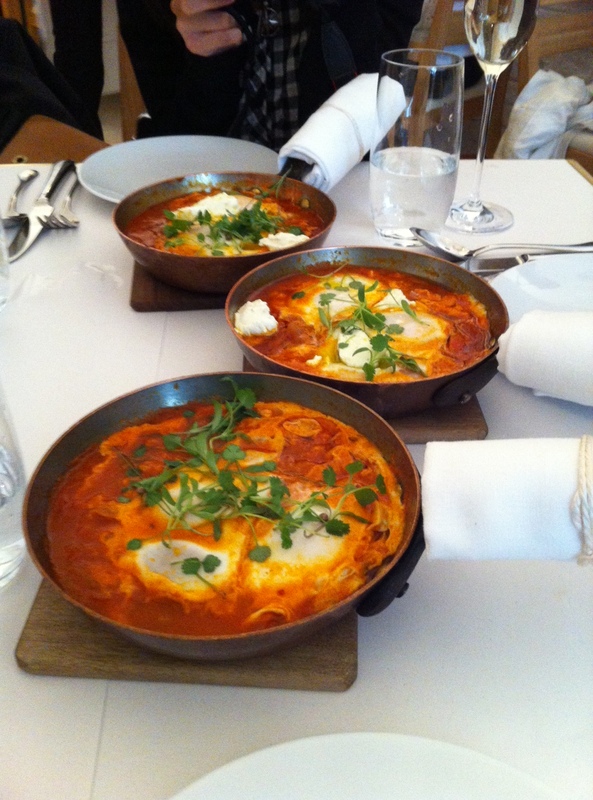 I chose the shakshuka, braised eggs in a piquante tomato sauce, with smoked labneh yoghurt. Four of us chose this, one had smoked salmon and scrambled eggs, and the other had a selection of pastries. Well what can I say? 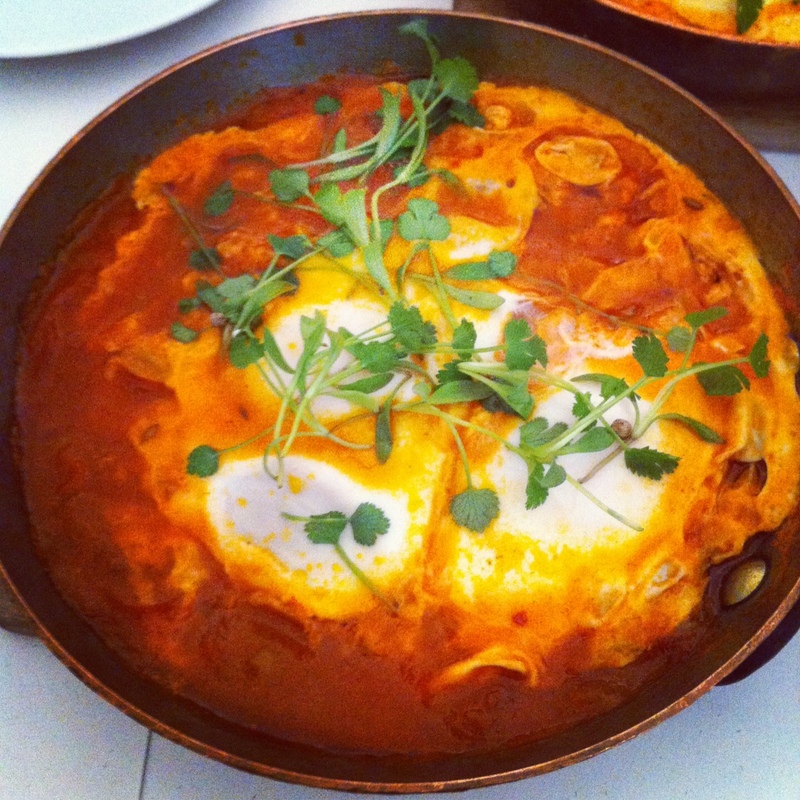 The shakshuka arrived in its’ own little pan, it looked and tasted absolutely divine. The eggs were perfectly cooked, the yolks beautifully runny and golden. Everyone thoroughly enjoyed their food, the service was impeccable, and a final word has to go to the bathrooms… Completely mirrored, inside and out, it was like a fairground attraction. There was even an arrow on the floor to point you toward the exit! Can’t wait to visit Nopi again, brunch with coffee and extra toast was £20. Very reasonable for such outstanding food. Shakshuka in its own individual pan. Yes, I know, it’s been a while! Lost my blogging mojo, but thanks to lunch with the LOVELY Emily from Chilli Marmalade I want to blog again! 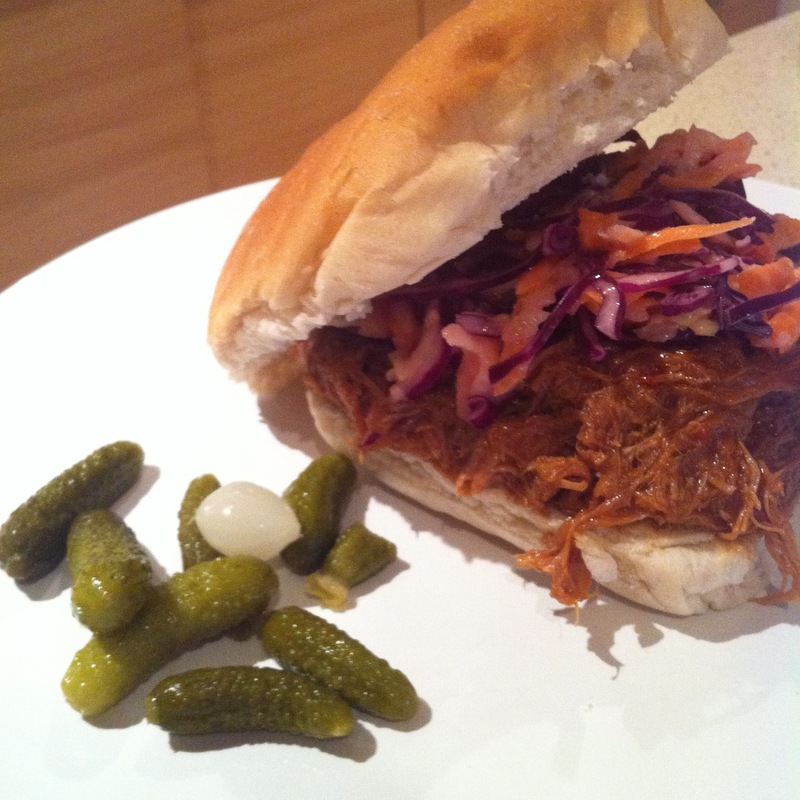 Words don’t do this recipe justice – just cook it and eat it and LOVE it! Thanks Emily! I’m a massive fan of meat. Every which way: oven-roasted, pan-seared, slow-cooked, fast-cooked, rare-bloody-gorgeousness and blackened charred sticky edges. Mostly, I like my meat barbequed. On my quest for the perfect barbequed meat feast, I paid a visit to London’s most popular barbeque joint, Pitt Cue Co in Soho a week ago and inhaled the most succulent pulled pork I’d ever tasted. Out to eat – twice in a week! This is virtually unheard of! Gone are the days we used to eat out three times a week, now we have a 6 year old, and I work extreme shifts, we generally eat out (on our own) about once every three months. We had a babysitter in the form of my Mum last week while we went out for a Greek meal, and while she was here, my son managed to twist her arm into letting him sleep at her house last night. So of course, it was rude not to go out again, wasn’t it? We decided on Wahaca, “Mexican Market Eating” at Westfield Stratford. The meal was very good, we would definitely return. We enjoyed quesadillas with potato and chorizo filling, chicken tostadas (crisp tortillas), chicken taquitos (corn tortillas), steak tacos, and a very interesting pot of “green rice”, which was rice, “blitzed with coriander, onion and garlic”. Quite honestly though, the pièce de résistance for me, unusually, was the dessert. 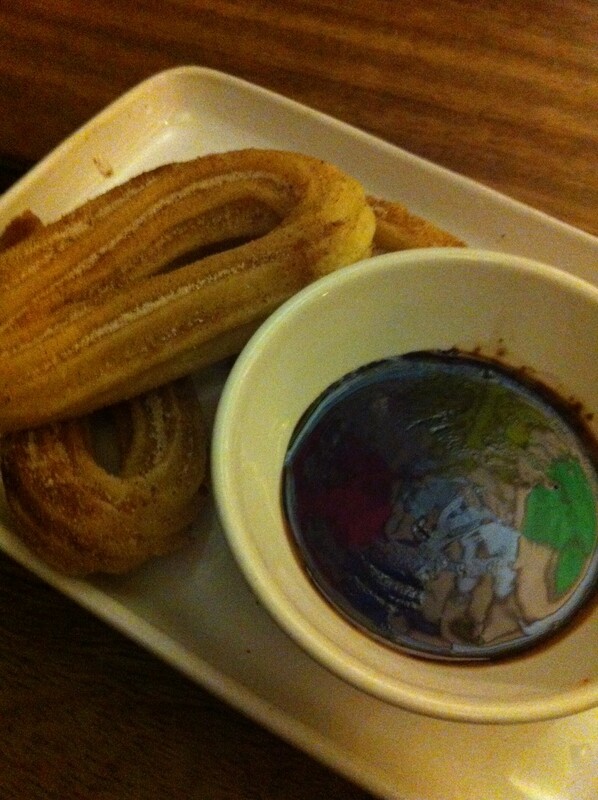 I chose ‘churros y chocolate’ Mexican doughnuts with a rich chocolate sauce to dip them in. Oh. My. Goodness. I had to share them with my husband, so I shall of course be returning, alone, SOON. The photo below says it all really. Wahaca was good value, we had five sharing plates, two desserts, a beer and a glass of wine (which came in a tumbler, I didn’t like that really! ), and it was £34. We will definitely be returning. Branches at Westfield Stratford City, Westfield London, Covent Garden, Canary Wharf, Bluewater, Soho, Charlotte Street, London South Bank. Before we went off to Cornwall in mid-August, I was contacted via Twitter by a company called ClemenGold, to ask if I would like to take delivery of, eat, and then review some of their South African citrus fruit. Free food you say? Ah, go on…. The very next day, a box of ClemenGold the size of a small country arrived. My son and I actually counted them, and there were 198! What on earth was I going to do with 198 clementines? Well my son got stuck straight in and we were immediately down to 195, as he declared them “Yummy!”. We put some in the fridge, gave some to the neighbours and my Mum, and then packed as many as we could in with our camping stores, as we were going the very next day. Well, the boy was right, they were simply yummy and delicious! 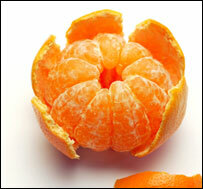 Easy peelers, beautifully soft and juicy, almost totally seedless and lovely and sweet. Thank you to Michelle at ClemenGold for sending them to me, we all enjoyed them very much. The ones in the fridge kept fresh until after we returned from camping, so we had plenty more to enjoy. Hello! Finally managed to wrestle the PC away from my son, he seemed positively glued to it over the Summer, but now he’s back at school and it’s all mine again. I will however investigate WordPress for iPad, that could make things a lot easier! We spent a few days in Cornwall in August, but the weather wasn’t really on our side. Some absolutely gorgeous days were followed by terrible nights filled with rain and howling wind. Not ideal when you’re in a tent…. We did have a lovely cream tea in Padstow though, that made us all feel better! Cream Tea but with apple juice! Before we went away, I was asked to taste test some lovely clementines, review coming up in the next post!